I saw it with my very own eyes: the transition from doubt to certainty; from disbelief to belief; from “is it?” to “it is”…….the journey- from I to We; from darkness to light…. The journey itself was a breeze, and the bhajans sung, the experiences shared: only geared us up for the big thing that was in store for us. We reached Dharmavaram station to the loving welcome from the heavens themselves- in the form of cool Breeze. As soon as we reached the Sumptuous dinner was waiting for us at the Punjabi Canteen, even though we reached a little late the ever loving volunteers in the Punjabi Canteen served us with pure love. The room-keys were allotted immediately after dinner. After a Good Nights sleep, our day started with Nagarsankeertan. The programme was drafted meticulously, and was supported well by all the Volunteers. After the melodious Bhajans we had an excellent Breakfast in south Indian canteen. Thereafter we visited the Chaitanya Jyoti, a museum made on Life of Sathya Sai Baba. Heritage museum was another wonder, in the spiritual township. Here the unity of all religions is very well displayed. After having one more tasty lunch and a short rest of 1 hour we proceeded towards the Hill view stadium for an event which cannot be penned down. We all were seated on the stands, and soon the 3 boys of STD 11th were introduced to us. These boys spoke with us extempore, and spoke with such an authority and confidence that the best of the orators would salute them. The talks concluded within 50 minutes and we proceeded towards the Superspeciality Hospital. The hospital is a marvel: technologically, structurally, medically and ideologically. It was not like any other hospital, but is a Temple, a Temple of Healing. The surprising fact I discovered that all the services including the medicines, treatment,stay,surgery and post surgery is free of cost and the hospital doesn’t have any cash counter. All the patients are treated at par including the rich and the poor, irrespective of caste and creed, religions and faith. Most patients were bound to feel better by merely being there, in those heavenly surroundings. We all were at once attracted to the concept of working in such surroundings, with qualitatively the best instruments- being put to their optimum, rightful use. And after seeing the Video Presentation and some lovely experiences by one of the hospital staff member, we headed back to the Mandir for Bhajans, the devotional songs sung by the students of Sri Sathya Sai Institute of Higher Learning. The Voice, Music and all the instruments were in such a harmony that we couldn’t imagine that these Bhajans were conducted sung by amateurs. The next morning, after the breakfast, we proceeded to Whitefield, Bangalore for Swamis Darshan. On reaching Whitefield we immediately went to the Super- Speciality Hospital. The grandeur, the magnificence, the beauty, the architecture, the organization, the facilities, the cleanliness- these gave us the impression of being in a palace, nay, in heaven! A feat, that is humanly impossible, where only Divinity reflected in its every aspect. Traveling back to Mumbai, we were in a trance. We still are. The experience that this was, it has been permanently etched in our memory. We are the blessed ones. We thank Sri Sathya Sai Seva organization and all their volunteers, for conducting this wonderful program and arranging it so professionally with Love, that we don’t have words to thank them. Today being Sunday, the Sevadals were in the first block, ready for the day-long Bhajan session. The Bhajans started at 9:30 a.m. At 10.15 a.m., the usual hustle started on-stage, heralding Swami's arrival. In a few minutes the screen next to the Krishna statue parted and there Swami was, giving the most benign of his smiles. He came walking to the railing near the end of the stage and stood for a while. The Porte chair was trailing him. Swami sat down on the chair for a few Bhajans. After a little while, Swami got up from the chair and indicated that He wanted to go down amongst the devotees. 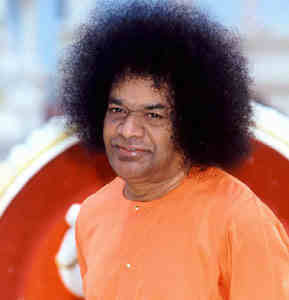 Swami made His way towards the lift, came down, walked a few steps to where Sri H.D. Deve Gowda, the former Deputy PM of India, was standing, blessed him, and started walking amidst the students. Watching Swami walk was thrilling as this was the first session when Swami actually walked amidst the devotees during this visit. Swami crossed the first block, then turned left and crossed over on to the ladies' side, all the while accepting letters from the devotees. Two brothers had the blessed opportunity to support Swami throughout. Once He reached the end of the first block on the ladies' side He turned to the left and made His way back onto the stage. Only when He reached on-stage did He sit down on the chair. There were few more Bhajans after which Swami asked for the Arati to be performed and then retired to Trayee Brindavan. The whole session lasted almost an hour and there was so much of Love radiating from Him and the whole audience was reverberating with joy. In the evening, the Seva Dal Bhajans were going on and Swami arrived at 5:30 p.m. He came walking onto the stage and sat down on the chair. The Brindavan Hostel boys had prepared a cultural programme. As soon as He sat down, He indicated to the students assembled in the front that they could begin. As soon as Swami gave them the permission, two boys ran up the stage with a huge card, seeking His blessings. The programme titled "Ocean of Devotion" was based on the Nine types of Devotion: Shravanam, Keertanam, Vishnusmaranam, Padasevanam, Vandanam, Archanam, Dasyam, Sneham, Atmanivedanam; and how the great devotees of all times had used these different types of devotion to merge with the Lord. Parikshit had used Shravanam to reach the Lord, whereas Meera Bai and Thyagaraja had used Kirtanam and so on. There were anchors for each form of devotion and they explained the significance of each type of devotion, and gave examples of the devotees of the Lord who followed that form of Bhakthi. The presentation was interspersed with beautiful songs, all chosen appropriately to that form of devotion. Just came from Brindavanam and immediately typing this message with lot of joy and happiness since today Swami seemed even better in walking, He gave darshan both in the morning and evening. He came through the curtain on the stage walking (with support) and even while taking the Aarti moves back walking to the curtain door on the stage. As soon as he comes, HE stands for a few minutes before seating very close to the end of the stage. We can see the beautiful full form of the lord. In the morning, he came down the stage from the Elevator and walked slowly on the gents side. In the Evening, he came at 5.30 pm, again walking from the curtain door, standing for a few minutes holding the grill support before taking HIS seat. Students of Brindavanam campus gave a beautiful program on Nava-Vidha bhakti, taking each of the Bhakti, mentioning the meaning, giving examples of Meerabai, Sabari, Prahalad etc and singing beautiful songs for each of the Bhakti. For some of the songs the entire hall was vibrant with chorus and clappings especially the qawalli "Shirdiwale Sai Baba" At around 6 pm, Governor of Karnataka ( T.N. Chaturvedi) and Vice-President of India (Bhairon Singh Shekawat) came for Darshan, they were made seated near the stage and were watching the students program. The program went on till 6.20 pm, After which Swami got up the seat, moved walking back to the curtain door. Yesterday and Today, Swami stood during the entire Aarti. Till the time I left Brindavanam at 7pm, the Governor and Vice-President were still in Trayee. Let us keep continuing our prayers and focus more stronger on our Sadhana of becoming better Swami's instruments and our self-transformation is Swami's medicine towards physical recovery. Brindavan Darshan, 29th Jan '06! A loving SaiRam from Bangalore. It was a very chilly morning. It was misty for most part. The morning Sun was trying its best to warm up the earth and earthlings. It hadn't tasted much success even at 9AM! It was still cold by our standards. By 10AM, this cold was receding, succumbing to the relentless morning Sun! And then it poured heavily! You can't believe it, right! This is not about Bangalore weather report on Sunday morning. It's all about the grace and bliss that rained, nay, poured by Bhagawan Sri Sathya Sai Baba at Brindavan! Yours truly was a victim of the Sunday cold and inherent laziness and set off for Brindavan by about 9AM. I see my watch as I enter the ashram and it shows 9:40AM. I could hear the bhajans going on! I was scared, has Swamy already come in? Has my laziness cost me some precious darshan time? Soon I discover, much to my comfort that Swamy hasn't arrived yet. But indications are there HE will be there any moment. I thanked HIM and assumed a position in the sparsely the occupied extension of the hall - my usual place! Bhajans are on. Ladies and Gents are alternating and rendering some beautiful bhajans. There HE goes in the central aisle and before the end, HE takes left into the ladies' side. They can't believe it! In earlier times, this used to be the entrance of Swamy as HE walked by. So HE goes to that row. It is too far for me and add the glare of the shining Sun, I can't see much as to what is happening. We back liners stand up in a bid to catch up. Will Swamy exit that way to the Trayee? I though so. But HE goes staright till near the Kalyana mandapam, enquires something from someone and takes a right and right again to reach the end near the stage. HE continues to the central aisle. On the way, HE is doing something, blessing, taking letters, enquiring.... Always busy! No wonder, HIS life is HIS message. HE continues through the front most row, ignoring the elevator, focussing on the students block. Students occupy the first block. There HE covers them and arrives at the right most aisle, again! Oh, the people, sitting near the right aisle are twice lucky! HE takes right and soon after crossing the student block, HE takes the in between row and comes over to the central aisle, again! And HE takes left there, that means HE is coming to the end of the hall, a second time! We were standing so that the eye can absorb every pixel of the divine sight that we are witnessing. I must confess, by now we are chanting the bhajans just mechanically and fully absorbed in the uncertainty that Swamy is showing that must have made the security team tear their hairs! As HE is coming towards us, HE is indicating to us to sit and also blessing. How beautiful! These moments will be firmly etched in my memory and will be recollected very fondly when I sit in Brindavan in the future darshans. I have written quite a bit. I am sorry if the narration is confusing anywhere. Suffice to say that the idea is to portray the bliss we derived and the "Love MY uncertainty" that Swamy often tells us. May the Lord of Brindavan bless us all with a clean mind so that we absorb what HE teaches us and implement those for our own benefit and show our gratitude to HIM. We love to you Swamy!